When it comes to compact SUVs, the Honda CR-V continues to stand out in a field that's filled with competitors. How? Honda's reputation for dependability doesn't hurt. And drivers opting for the new CR-V also love the excellent fuel economy they experience driving the sporty crossover. Like other Honda models, the CR-V tends to retain its value. But it's also what this SUV has to offer for tech-savvy buyers that make it even more attractive. There is available Bluetooth® technology, SMS text message function, available vice recognition, and much more. Roomy enough for growing families and busy carpoolers alike, the sporty and reliable new CR-V boasts plenty of interior comforts and tech features that make driving it fun and convenient. The Honda CR-V LX, the compact SUV's base model, gives drivers a lot of amazing features, including things like Bluetooth® power door locks and windows, cruise control, and much more. Of course, choosing higher-level trim levels provide even more amenities. To learn more, just keep reading! The new Honda CR-V comes equipped with a direct injection, 16-valve DOHD i-VTEC® in-line 4-cylinder engine. The 2016 CR-V's engine produces a strong 185 horsepower at 6,400 rpm and 181 lb-ft. of torque at 3,900 rpm. All trim levels feature an Eco Assist™ system, Hill Start Assist, direct ignition system with an immobilizer, and more. A CVT (continuously variable transmission) is standard equipment on all Honda CR-V 2016 models, and there is an available all-wheel drive option as well. Then 2WD CR-V's engine gives drivers an EPA-estimated 26 miles per gallon in the city, 33 miles per gallon on the highway, for a combined mpg of 29. * When equipped with AWD, the 2016 CR-V's engine generates 25 miles per gallon driving in the city and 31 miles per gallon on the highway. * That works out to 27 combined miles per gallon. California drivers are also happy to discover that the 2016 Honda CR-V earned a California Air Resources Board (CARB) emissions rating of ULEV-2 (Ultra Low Emission Vehicle). Insid the 2016 CR-V, small-SUV shoppers are treated to room for five adults to sit comfortably, with plenty of headroom, hip room, and legroom. Opening the tailgate reveals an ample cargo area. With the back seat in its usual, upright position, the CR-V has 37.2 cubic feet of cargo area. Folding the seat down gives drivers even more room, with a maximum capacity of 70.9 cubic feet, enough to haul camping equipment, sporting goods, luggage, and more. Buyers choosing the new Honda CR-V might be surprised to learn about all of the incredible safety features provided with the vehicle. Even choosing the base model CR-V LX gives drivers a slate of important active safety features to help drivers avoid accidents or mitigate the severity of a collision if one does occur. The Honda CR-V LX includes an anti-lock braking system, Electronic Brake Distribution, Brake Assist, Tire Pressure Monitoring System, daytime running lights, a multi-angle rearview camera with guidelines, and Vehicle Stability Assist* with Traction Control. Of course, opting for higher-level trims affords buyers even more features, and those driving the 2016 CR-V Touring model get LED daytime running lights, the multi-angle rearview camera with dynamic guidelines, Collision Mitigation Braking System*, Forward Collision Warning, and Lane Departure Warning. Passive safety features included as standard equipment for the CR-V consist of Advanced Compatibility Engineering* (ACE*) body structure, dual-stage, multiple-threshold front airbags (SRS), SmartVent® front side airbags, side curtain airbags with rollover sensor, 3-point seat belts at all seating positions, child-proof rear door locks, and much more. Come to Manly Honda, a Honda dealership in Santa Rosa, CA today to find your Honda CR-V. After you experience all that the new CR-V has to offer, we know you are going to want to take one home with you. So why not come in to test drive the Honda CR-V today? It's the best way to discover the compact SUV's smooth ride, plush interior, and tech features. Our sales team can demonstrate features or you can try them all out for yourself. 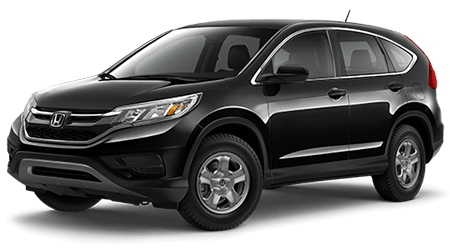 You will find our Honda dealership near Petaluma and Sebastopol, and we offer a fantastic inventory of new Honda vehicles, including the brand- Honda CR-V. You can get started by shopping on the Manly Honda website. There, you will have the opportunity to see each vehicle's specifications, trim level, options, available colors, and a lot more. After you find the Honda CR-V that captures your heart, just book an appointment for a test drive with Manly Honda. Our caring staff is waiting, and we love watching happy customers drive away in the new Honda of their choice! The Manly Honda website offers an array of tools, buttons, and menu options that will help you research any new Honda in our inventory, including the 2016 CR-V. For example, if you are looking to trade in your current vehicle, you can find out how much it's worth with our quick and easy Value Your Trade form. Something else you can do that will save you a lot of time is to complete our simple online auto loan application. Once you are pre-approved, usually in a matter of minutes, you can come to our Honda dealership near Petaluma to take finish up the buying process. Make sure you visit Manly Honda for all of your Honda automotive needs. Our Honda dealership is located at 2777 Corby Ave in Santa Rosa, so if you are looking for a new Honda near Sebastopol, come to our dealership to find it! If you are already the owner of a Honda CR-V or any other Honda, bring your vehicle to us for regular maintenance and repairs. Our service center is manned by Honda certified technicians, and they can help you keep your new CR-V in great running order. At Manly Honda, you get the same great service on our website and at our Santa Rosa Honda dealership. Visit us today!